CONSTABLE CHRIS DIAZ AND JACINTO CITY POLICE CHIEF JOE AYALA display some of the illicit drugs such as “Kush” that were confiscated in the area. New ordinances in Jacinto City and Galena Park will give officers more authority to remove these drugs from their communities. Last week Jacinto City council passed an ordinance on first reading, that will give the police authorities in their jurisdiction more ability to arrest people that have illicit drugs in their possession. In a like move, Galena Park council on Tuesday of this week had the first reading of a similar ordinance, that will also give local police the authority to remove these drugs from the community. The proposed ordinance was read for the record by City Attorney Jim DeFoyd, and each council will take a final vote at their next meeting, adopting the measure. 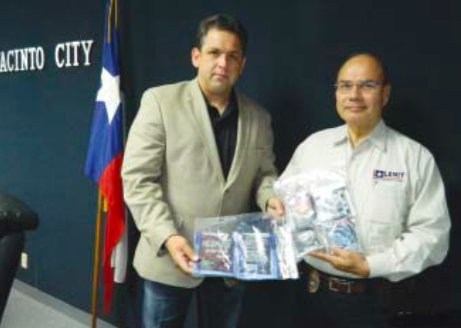 At last Thursday’s council meeting in Jacinto City, police chief Joe Ayala distributed a brochure on various types of illicit and illegal drugs that his department has had to deal with recently. These include synthetic drugs with street names such as Kush, K2, Smiles, Spice, Bath Salts, Blizzard, N-Bomb, Fake Weed, and Black Mamba. Kush is a derivative form of marijuana. Synthetic drugs are created using man-made chemicals. They are known as designer drugs, and there chemical state is slightly altered, to avoid being classified as an illegal drug. This ordinance is designed to cover these variations, making it possible for law enforcement agencies to apprehend and prosecute those who posses the designer drugs. Chief Ayala said that the problem occurs in Jacinto City and Galena Park when dealers and users move in, away from more restrictive prosecution in Houston and other jurisdictions. Ayala said this has been an increasing problem for his department, and he welcomes the ordinance. If found guilty of possession, the new ordinance will provide for a fine up to $2000. This is meant to discourage the establishment of new smoke shops within the city limits. Councilwoman Carmela Garcia told the story of a friend who used “Kush” and due to the after affect committed suicide.